Bouquets and single flowers are the perfect gift for almost any occasion, from birth and weddings to sickness and funerals. Whether you present a solitary long-stemmed rose or a bouquet, you’ll remind the recipient that you were thinking about him or her. Most men know that flowers are the perfect way to show their affection, so they often give bouquets to the women in their lives. However, many guys appreciate being on the receiving end of floral arrangements as well. On special occasions, such as birthdays, Valentine’s Day, or anniversaries, choose flowers that mean something in your relationship. Whether you choose to purchase flowers from a traditional florist or from your neighborhood grocery store, put some time and thought into the variety and color. You'll want to consider personal taste, decor, symbolism, and the occasion. If you receive flowers, treat them as you would any other gift. Send a thank you note to show your appreciation. Regardless of the size of the wedding, most couples consider flowers one of the most important things to consider during the planning process. Whether you're having a traditional ceremony or getting married on a beach, you'll probably want to include bouquets and floral arrangements. According to Jeana Utheim, florist and owner of The Blossom Shop in Summerville, South Carolina, trends change from year to year. "Colors and styles typically match the trends in fashion and home decor, with this year's most popular colors being blush and mint green. Garden roses and peonies are very popular." Some brides are choosing a variety of flowers, either to match the bridesmaids' dresses or to provide a more casual touch to the event. There currently isn't a right or wrong way to do flowers at weddings. Lovers have traditionally given flowers that speak of their special relationship on Valentine’s Day. The red rose or chrysanthemum speaks of all types of love, while a white carnation symbolizes pure and chaste love. Young love can be shown by the presentation of a primrose. Since love is heartfelt, and blood comes from the heart, the most common color of flowers on this romantic day is red. However, any color – whether it a favorite hue or has a special meaning to the couple – is appropriate. The most popular flower for Valentine’s Day is still the rose. If you choose to give roses, remember that the red rose symbolizes love, the yellow rose shows friendship, the pink rose represents admiration, and the white rose indicates purity and innocence. Flowers are a colorful way to celebrate any occasion. Almost any type of flower is appropriate, but you can make it even more special by taking into consideration the symbolism of each variety. Roses and carnations are common and easy to find. If you want something different, think about selecting the amaryllis that symbolizes encouragement and acknowledgment for a job well done. The delicate camellia depicts a variety of things, including excellence, passion, desire, and finesse. Secret admirers may send a mysterious greeting in the form of a bouquet that includes a single dahlia. Another thoughtful special occasion flower is the daffodil. They consistently bloom in early spring and symbolize truth and forgiveness. However, if you need to apologize to someone, the daisy is the perfect token of your intentions. The dahlia is another interesting choice because it has a variety of meanings. A gift of a bouquet of dahlias or dahlias mixed with other flowers can depict change, uniqueness, or excitement. "Traditional spray rose corsages are a hit for prom," states Utheim. "They come in a variety of colors." This makes them a good option for matching the girl's dress. A thoughtful floral bouquet makes the perfect birthday gift. Any flower is appropriate for birthdays, including roses, carnations, and orchids. Another popular birthday flower is the daisy that symbolizes innocence and modesty. If you want to give your friend flowers for her birthday, the daisy may be a good choice. Many young women still enjoy plucking the petals off the flower and saying, “He loves me, he loves me not.” The last petal plucked provides the outcome of the man’s feelings. The best birthday bouquets are chosen based on the recipient's favorite flowers or those that symbolize an aspect of the relationship. Choosing a flower for Mother’s Day is simple. All you have to do is pick one that you know is her favorite. If she likes all types, consider giving her a spring bouquet with a variety of colors and varieties. Carnations are always a good choice if you’re not sure what she likes. They are an excellent expression of love and admiration. You might consider giving her a carnation corsage in her favorite color. If you are invited to someone’s home for a holiday party, don’t forget to bring a gift. Most hosts appreciate a bouquet of flowers or a live poinsettia. You can find the poinsettia in a variety of colors including red, white, yellow, or green, with red being the most common and popular. Other popular flowers for the holiday season include winter jasmine, amaryllis, narcissus, and iris. Consider combining several for a festive bouquet or making a statement with a single stem. You may even want to add a nontraditional flower to your holiday bouquet to make it more unique. Always ask the family of the deceased whether they prefer flowers or a charitable donation. 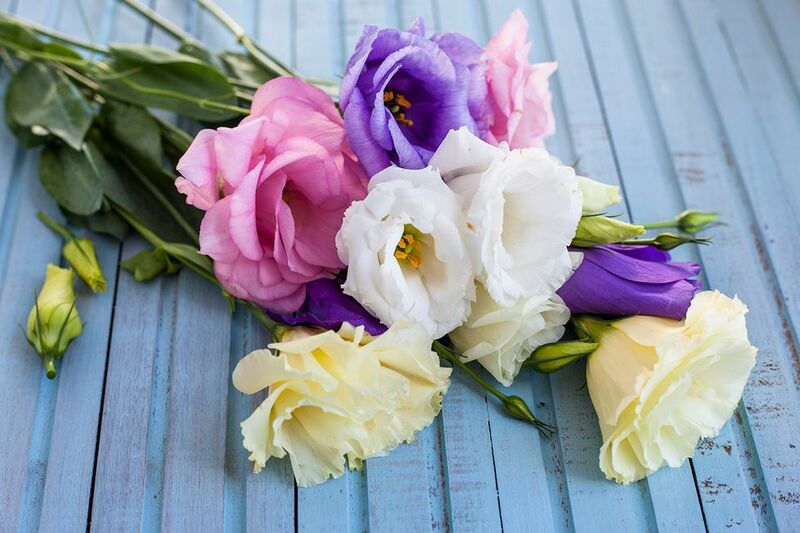 If the bereaved is accepting flowers, select something appropriate that can be viewed during the funeral service, taken home afterward, or placed on the grave later. Regardless of the type of flowers you choose, always include a brief sympathy card with the arrangement. "Baskets that go to the gravesite are very popular now," states Utheim. "Hydrangeas and lilies offer a nice presentation for funerals."